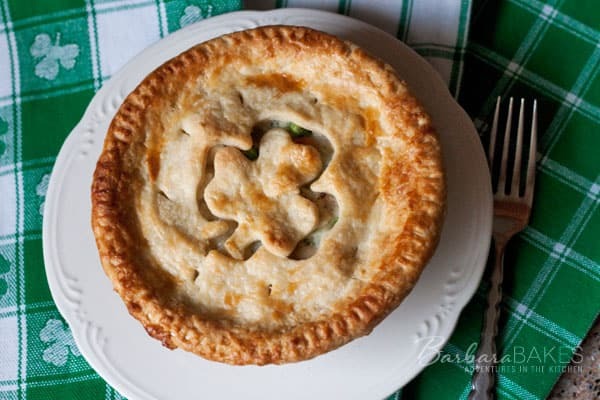 Comfort food with a St. Patrick’s Day twist. 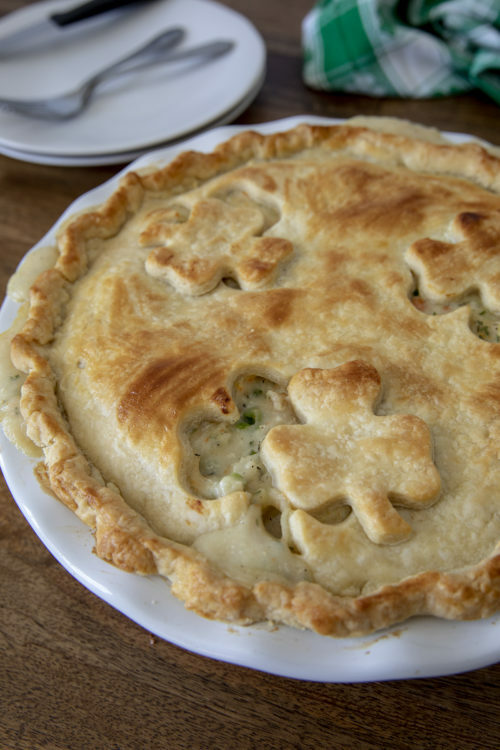 Individual pot pies with a clover in the middle of a tender, flaky crust, hiding a chunky chicken and vegetable filling in a creamy white sauce. Also included in this post is a Recipe Round Up. I’ve joined a fun group of bloggers to put together a roundup of recipes on the first day of every month. 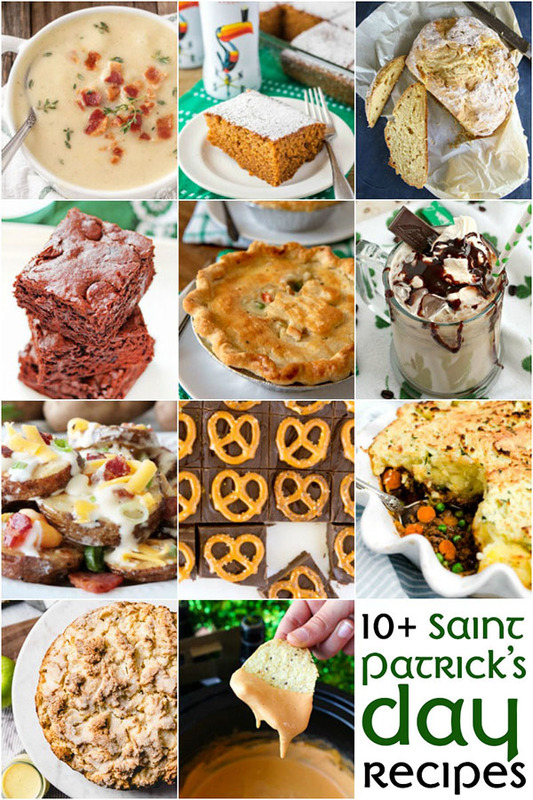 This month we’re sharing St. Patrick’s Day Recipes. My mom often cooked frozen pot pies when I was growing up. They were easy, filling and best of all cheap. It wasn’t until after I got married I realized that they really weren’t very tasty. I switched to the Marie Calendar frozen pot pies, which was definitely a step up, but ever since I started making pot pies from scratch, a frozen pot pie just won’t cut it anymore. Making them at home is a bit time consuming, but not difficult, and the end result is comfort food at it’s finest. 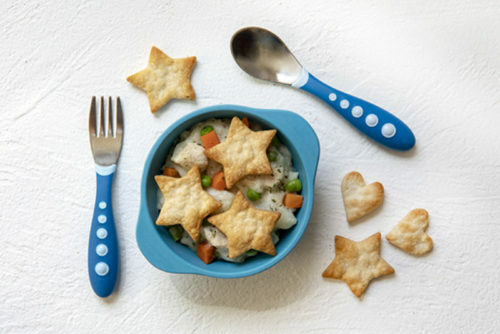 Pot pies are one of my kids’ favorite dinners. 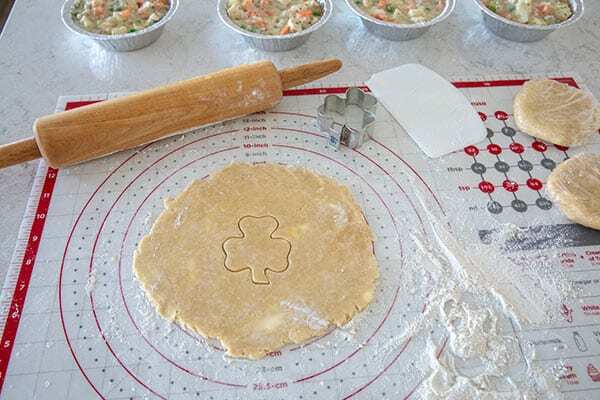 Usually, I make a large pot pie in a 9×13 pan, but I decide to change it up for St. Patrick’s day and make individual pot pies. You need more crust making individual pies, but more crust is never a bad thing in my book. You can make your pot pies in any oven safe dish. I bought some disposable tins at the grocery store. In the past, I’ve made them in cute little soup crocks and left the pastry edge unfinished. 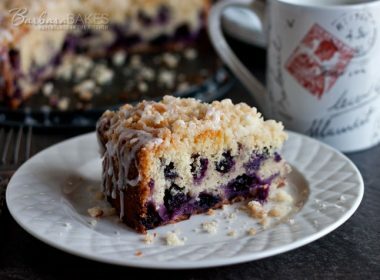 I like the rustic look and not having to waste any of my favorite part, the crust. My daughter likes to cook the crust separately while she’s making the filling. 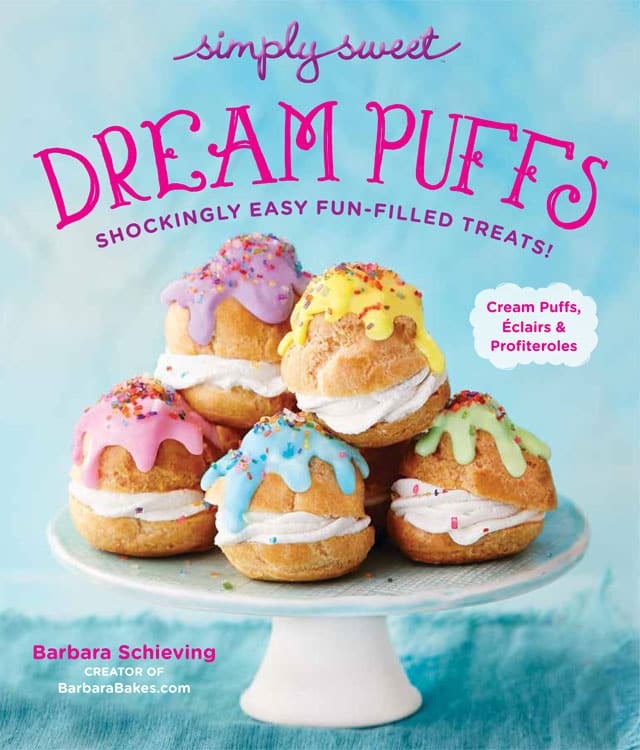 She cuts the crust into fun shapes and serves the cut outs on a plate so the kids can top the filling with as many fun shapes as they’d like. You can also make the chicken pot pie filling in the pressure cooker, which is my go-to method on nights I’m not using leftover cooked chicken or rotisserie chicken. Any way you make it, it’s pure comfort food and your family will ask for it again and again. Heat butter over medium heat until melted. Add onions and cook until tender, about 5 minutes. Whisk in flour, salt and pepper. Cook over low heat, stirring constantly until smooth and bubbly. Gradually stir in chicken broth and milk. Heat to boiling and boil for 1 minute, stirring constantly. (Add more milk if it's too thick). Remove from heat and stir in chicken and vegetables. 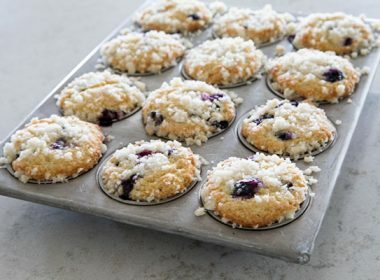 Pour into individual baking dishes and top with pie crust. Cook uncovered 30 to 35 minutes or until golden brown. Let cool a few minutes before eating. Combined flour and salt in a bowl. Cut butter into small cubes. Cut butter and shortening into flour mixture until it resembles very coarse meal. Gradually add water. Divide in four equal pieces, form into round disks, and wrap in plastic. Chill for 30 minutes. 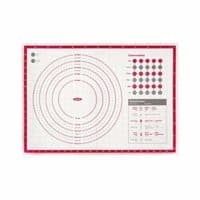 On a floured surface, roll out each crust at least 1" larger than baking dishes. Now, that is so cute. I love it when I see clever ideas like this that require going far out of your way to make something extra fun and special. Very cute dish to serve for St. Patty’s Day! One of my all time favorites. I never get tired of these and neither do my grandkids! Something I do is to stew the chicken carcass covered with water, salt, pepper, poultry seasoning. Strain, cool & pick the chicken. Then I add all the veggies that are going in it, along with the onion, to the 2-3 quarts of broth and simmer until all are of the same consistency. You wouldn’t want to add the frozen green peas until the very end and boil about 1 or 2 minutes only. Then I follow your basic recipe here, to build the pie, scooping out the right amount of veggies after thickening the broth with flour, butter, broth. Then I stir in a can of cream of mushroom soup. 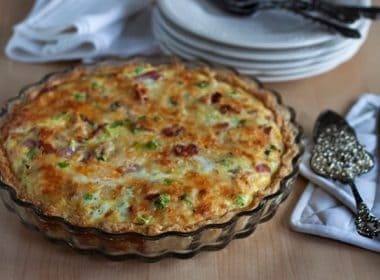 *(If you’re making a homemade pie crust, sprinkle a little poultry seasoning into your flour 1st.) The reason I do it like this is that I now have a big pot of soup left over that’s fine just like it is, or add noodles or brown & wild rice. Or, you can make several pies at once and freeze them. Making your own chicken broth is a delicious idea. Ben loves chicken pot pie! 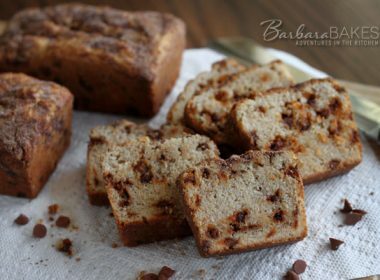 Barbara, I just made this delicious recipe! I’m so happy with myself. Chicken Pot Pie has been on my bucket list for years. Pastry scares me but thanks to this great recipe I made a yummy pot pie. The filling tasted great. I did up the veggies and cut down the meat a little just because that is what I had. I will make it again and again. Hubby loved it, he has been wanting me to make pies for the last 37 years. I guess I am finally old enough to make pies! I’m posting my pie for PI day tomorrow. Thanks again Barbara. How fun! 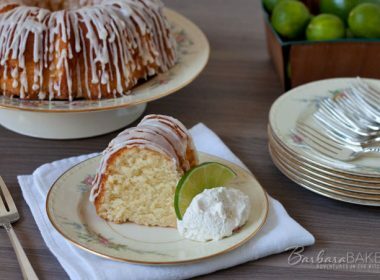 I’m so glad I could inspire you and that you and hubs loved the recipe. I’ll look forward to your post. I couldn’t wait till midnight it’s now up! This looks perfect! 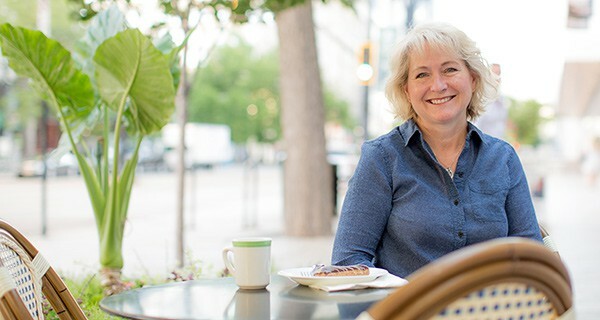 I love pot pie and ate them as a kid also. I’ve made them at home, but mine never looked this cute! Cute AND delicious!? This is too good to be true. 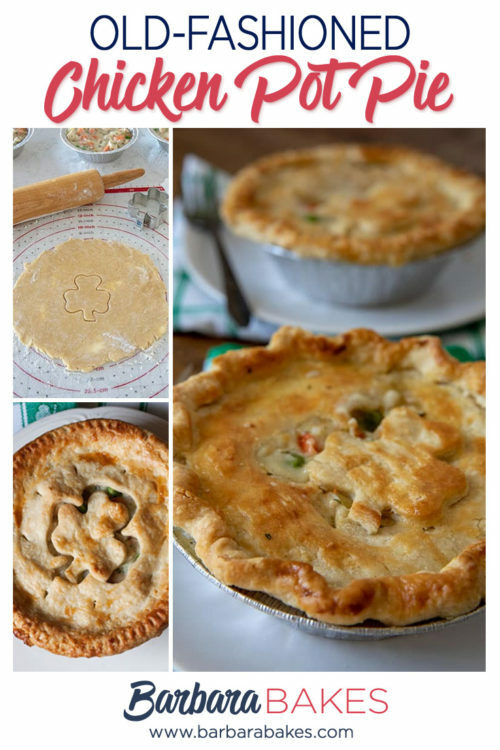 This is such a pretty pot pie! I love the shamrock on top. 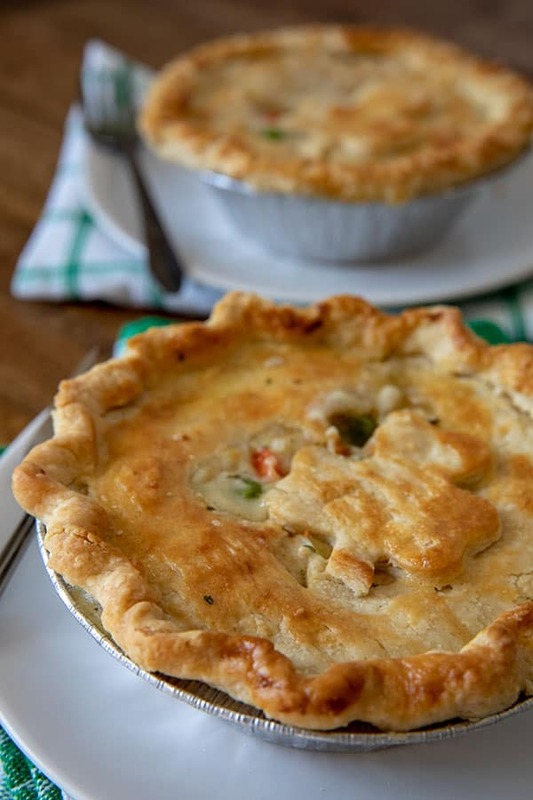 This is the best time of year for collecting pot pie recipes, a favorite in our house. Thanks! These look delicious. Great pictures too. I remember frozen pot pies. Those were Saturday lunch during the winter for us kids. This sounds healthier! We’re haviing a party at Tumbleweed Contessa and I’d love it if you’d bring these over.